The x,y location specifies the position for the top-left of the image. The observer parameter notifies the application of updates to an image that is loaded asynchronously. The observer parameter is not frequently used directly and is not needed for the BufferedImage class, so it usually is null. The described method addresses only the case where the entire image is to be drawn, mapping image pixels to user space coordinates 1:1. Sometimes applications require to draw a part of the image (a sub-image), or scale the image to cover a particular area of the drawing surface, or transform or filter the image before drawing. The src parameters represent the area of the image to copy and draw. The dst parameters display the area of the destination to cover by the the source area. The dstx1, dsty1 coordinates define the location to draw the image. The width and height dimensions on the destination area are calculated by the following expressions: (dstx2-dstx1), (dsty2-dsty1). If the dimensions of the source and destinations areas are different, the Java 2D API will scale up or scale down, as needed. The following code example divides an image into four quadrants and randomly draws each quadrant of the source image into a different quadrant of the destination. Note: If you don't see the applet running, you need to install at least the Java SE Development Kit (JDK) 7 release. The complete code for this applet is in JumbledImageApplet.java. 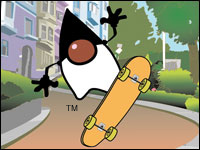 This example uses the following code to paint the jumbled duke_skateboard.jpg image. It iterates over the four sub-images of the source, drawing each in turn into a randomly selected destination quadrant. * drawing of one subarea to another subarea. The BufferedImageOp parameter implements the filter. The following applet represents an image drawn on top of text. Drag the slider to show more or less of the text through the image and make the image more or less transparent. The following code shows how the filter action is done by operating on a BufferedImage object with an alpha channel and rescales that alpha channel by using the RescaleOp object. The alpha channel determines the translucency of each pixel. It also specifies the degree to which this image overwrites. 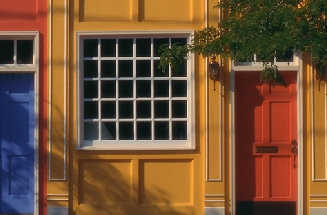 The complete example represented in SeeThroughImageApplet.java includes the code that uses the slider to adjust the transparency from the initial 50%. This example also requires the duke_skateboard.jpg image. ConvolveOp. Each output pixel is computed from surrounding pixels in the source image. It may be used to blur or sharpen images. AffineTransformOp. This filter maps pixels in the source to a different position in the destination by applying a transformation on the pixel location. LookupOp. This filter uses an application supplied lookup table to remap pixel colors. RescaleOp. This filter multiplies the colors by some factor. Can be used to lighten or darken the image, to increase or reduce its opacity, etc. The complete code for this applet is in ImageDrawingApplet.java and this applet requires the bld.jpg image. Use the drop-down menu to select an image scaling or filtering operation.